The budding of life brings a fresh, new beginning – a soliloquy of nature resounding the promise of hope and new life. I absolutely love spring break in Colorado…a brief glimpse of what is to come, interrupted briefly by the grand finale of heavy, wet spring snowstorms, culminating just in time to let our hearts fill with joy at the arrival of gorgeous Colorado summer weather. Springtime in the Rockies is a sight to behold, and by far my favorite season of the year! With this transition in seasons comes prime opportunity for adventure, fun and learning in the Denver area. With snow in the mountains, you can hit the slopes early – sunshine included – and head back down to town for an evening of capris and flip-flops. You can shred and tan all in one day…some dare to combine the two but that looks cold to me, ha. If you’re going to get the most out of your spring break, you’ll want to design a plan of action. Call a family meeting, make a priority list, choose some “plan B” items, sort the details and be sure to watch the forecast daily – Colorado can keep you on your toes! To make this year’s spring break really interesting choose a theme – something your children are interested in – and plan around it. Include costumes and face paintings in your exploration of our amazing city. Use cookie cutters to pack themed sandwiches and peanut butter tortilla snacks in your sack lunches. Incorporate themed lessons in your activity choices – you’re children won’t even notice that they’re learning when they’re having this much fun. Along side your chosen theme, make an effort to volunteer in the community. Contact a local venue and ask if your family can come help for a day. This can also be a great way to visit an attraction you might not normally be able to squeeze into the fun budget. Contact Volunteers of America if you are short on ideas – be sure to tell them your plan with a purpose and see what recommendations they make. Volunteering is a great way to give back to the community, build leadership skills and to instill empathy in our children. When making your adventure plans, focus on a specific area of town. Here are some ideas, categorized by geographic area. Remember not to over-schedule so that you don’t run out of steam too quickly! 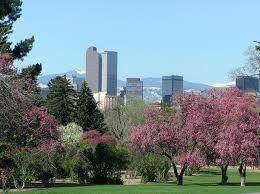 Botanic Gardens (Denver) – Beautiful gardens indoor and out, March 20th, FREE Day. The Denver Firefighters Museum (downtown) – Adults $6, children 1-12yrs $4. United States Mint Tour (downtown) – Discover how our currency is made and take home a souvenir, FREE. Molly Brown House Museum (downtown) – March 23rd, Meet the Headlining Women in Colorado’s History, tea and treats in museum store, $10. Racine’s Restaurant (between Cherry Creek shopping and downtown) – Giant gingerbread pancakes and beautiful works of art, need I say more? Steuben’s Restaurant (downtown) – Diner atmosphere, excellent kids meals with carrot sticks, cucumbers with ranch, edamame beans, fresh berries and choice of entree and side. Il Vicino (downtown & other locations) – Micro brewery, great food, charming atmosphere and kids can make their own dessert using pizza dough. Central Denver offers endless entertainment options for people of all ages. I’ve purposely left out some of the main attractions and highlighted places you’ve possibly never visited. Try something new this spring break! Adventure Golf & Raceway (Westminster) – Season opening Friday, March 11th, impressive atmosphere, fun for the whole family, prices vary based on activity. Jumpstreet (Thornton) – Wall-to-wall trampolines, $8-$12 first hr, week day discounts. Butterfly Pavilion (Westminster) – Adults $8.50, children 2-12 yrs $5.50. Hudson Gardens (Littleton) – $1.50 admission this year in celebration of their 15th birthday. The Streets at SouthGlenn (Centennial) – Beautifully lit at night with several places to stop for a bite to eat, see a movie at the new Hollywood Theater. Westlands Park (Greenwood Village) – Spend an entire day here, huge park with something for everyone, FREE. Pasquini’s (Lone Tree & other locations) – Great atmosphere, delicious Italian food and you can play with dough while you wait! Yogurtland (Centennial) – Variety of frozen yogurt choices, add your own toppings and it’s only $.30/oz. Great price for a family dessert night out! Wings Over the Rockies Museum (Denver) – Air and Space Museum, adults $9, children 4-12 yrs $6, under 4 free. Wild Life Experience (Parker) – Adults $10, children 3-12 yrs $6, under 3 free. Monkey Bizness (Centennial) – Even big kids can play, climb and bounce here. Children 12-23 months $3, 24mos – 18yrs $7.50, parents are free, check schedule for open play hours. Dinosaur Ridge (Morrison) – Exhibits, shuttle tour, and real dino tracks, just a few dollars/person, 3 and under are free. Buffalo Bill Museum and Grave (Golden) – Adults $5, 6-15yrs $1, 5 and under are free. Casa Bonita (Lakewood) – It’s about the atmosphere and entertainment, kids love it, menu is limited. Euphoric memories from your childhood? Visit again it hasn’t changed. Letterboxing – Go on a real-life treasure hunt. Letterboxes are hidden all over the Denver area! Pottery Painting – Find a paint-your-own pottery near you! Prices are per project and make fabulous keepsakes for parents and grandparents. Outdoor Fun – Colorado offers endless FREE fun outdoors. Choose a location, dress for the weather and have a blast! Scrapbook – Be sure to keep a record of your spring break adventure. Kids can practice journaling and note all that they are learning. Restaurant.com – Enter a zip code and try something new…at a discount! Science & Cultural Facilities District, Denver – With a mission for advancement and preservation of art, music, theatre, dance, zoology, botany, natural history and cultural history, this website provides a listing of excellent learning opportunities all around the Denver area – including a free days listing. Denver 365 – For a listing of year-round area events. What adventure will you choose this spring break? Some venues provide group, local resident and senior discounts. See individual websites for details.